Your body is more than what you see when you look in the mirror – there are different parts that have different jobs, but each part works together so you can eat, sleep, sit in class and play with friends. Your body is a pretty amazing thing! While there’s lots happening on the outside that you can see, such as scratching an itch, eating lunch with your friends at school and running outdoors, there’s even more happening inside. Find out more about your bones and muscles, and about your five senses and the nervous system. You have five digits on each hand and each foot, making 10 fingers and 10 toes altogether. Can you count to 20 using your fingers and toes? Each bit of our body is made up from cells, which are the tiniest form of life – like single Lego pieces. The parts of our body need blood in order to work properly – blood transports the nutrients each cell needs, and takes away any rubbish. The heart keeps blood pumping throughout our body – the heart is one of our vital organs, which means it helps keep us alive. Parts of your arm include your hand, wrist and elbow. Parts of your leg include your foot, ankle, shin and thigh. The parts of your body that help your arms twist around are called shoulders – your legs are attached to hips. Your neck allows your head to move from side to side, so you can turn your face to look at something. Your stomach sits inside your body, just below your chest and lungs, and above your intestines. 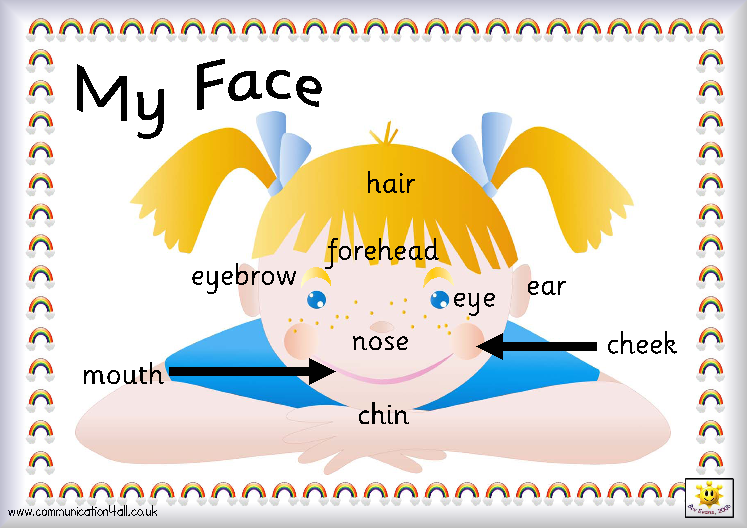 Parts of your face include your forehead, eyes, cheeks, ears, nose and mouth. Fingernails often grow more quickly than toenails. If you measure the distance between your wrist and your elbow, that will be about the same as the length of your foot. The largest organ inside our body is the liver. Your funny bone isn’t really a bone at all – it’s a nerve at your elbow, which is why you feel all tingly when you accidentally hit it. The parts of you arm are – hand (and fingers), wrist and elbow. Your arm connects to your body at your shoulder. The parts of your leg are – foot (and toes), ankle, shin, knee and thigh. Your leg connects to your body at your hip. Because we’ve got two ears, eyes, arms, hands, legs and feet, we use ‘left’ and ‘right’ to tell them apart. Feet and hands together in a yoga pose! You need strong arms to play softball! Our body contains trillions of cells – cells are the smallest recorded living things. In addition to keeping our cells healthy and clean, our blood also works for our immune system and contains antibodies and white blood cells that fight germs and diseases. Vital organs are the parts of our body that we need to stay alive. These include the heart, brain, lungs, kidneys, liver and pancreas. Our body has symmetry – that means it looks the same on the left side as it does on the right side. Muscular system – how we move around; our muscles allow us to do everything from walking and running to picking things up and laughing at jokes! Keep clicking on the right sequence to score points in this left, right, back and forward game. 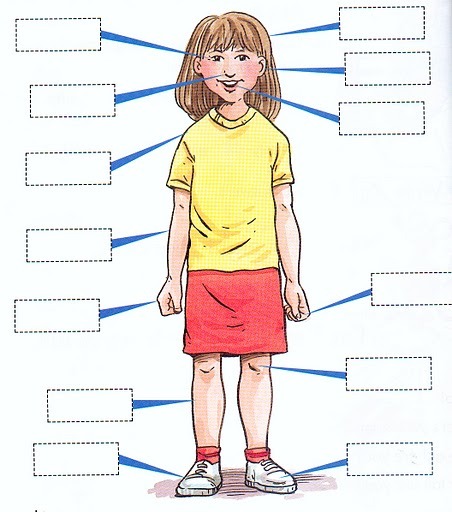 A variety of games that help with practising body vocabulary. Play around by dragging and dropping items onto a blank face. Show off your medical knowledge with CBBC Operation Ouch quizzes. Race against the clock to build a body as fast as you can. Explore the body from inside out in this interactive game. Put tissues together and build an organ in an online Centre of the Cell game, then put a patient’s organs back in the right places in a race-against-time activity. Strange but true facts about the human body from National Geographic Kids. The Bodyworks games will help you explore different parts of your body. 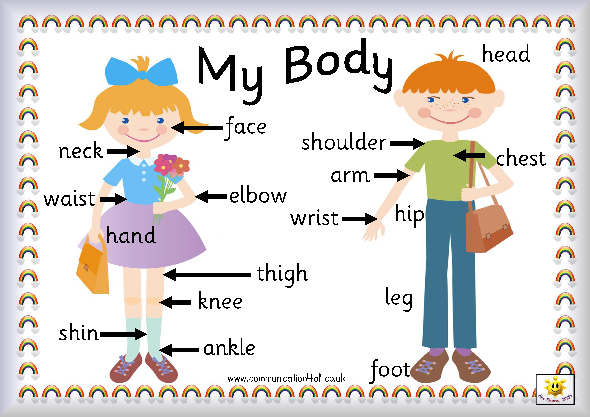 How quickly can you put body parts in the correct place in this online game?